A few years ago, Newsweek featured a cover story about the decline of creativity in America. I think many educators would agree and, perhaps, point to an emphasis on standardized testing. Unfortunately, there is much less importance placed on divergent and creative thinking. 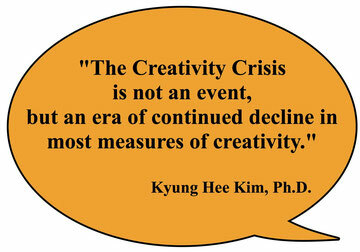 Dr. Kyung Hee Kim, a professor at William and Mary, continues to address this topic. Her research, which “has focused primarily on creativity, what it is, and how it is related to society, education, and other aspects of life including intelligence,” shows how creativity has decreased in the U. S. since 1990. Read more about her research at The Creativity Post here.